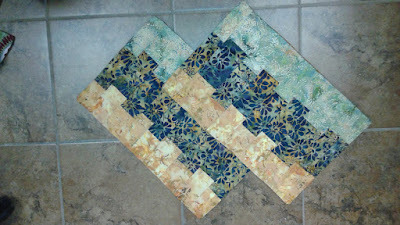 Today I continue to show you the steps in creating my new show quilt Pentaflora which will debut at UQSM next weekend. 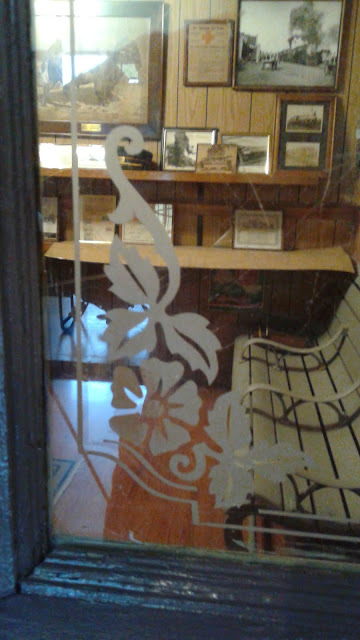 In case you missed it, here is a link to Pentaflora Part 1. Layer 3. 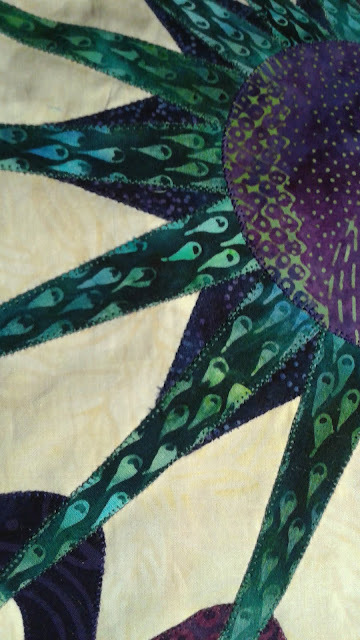 You can see that I use a blue water soluble pen to mark my applique designs on the fabric. I also thread baste my pieces instead of using applique pins. The whole piece with Layer 3 added. And Layer Four. I love the purple tulips! I'm not really sure how I came up with this pattern, but it was fun to stitch out. Start by making a 1 inch circle. 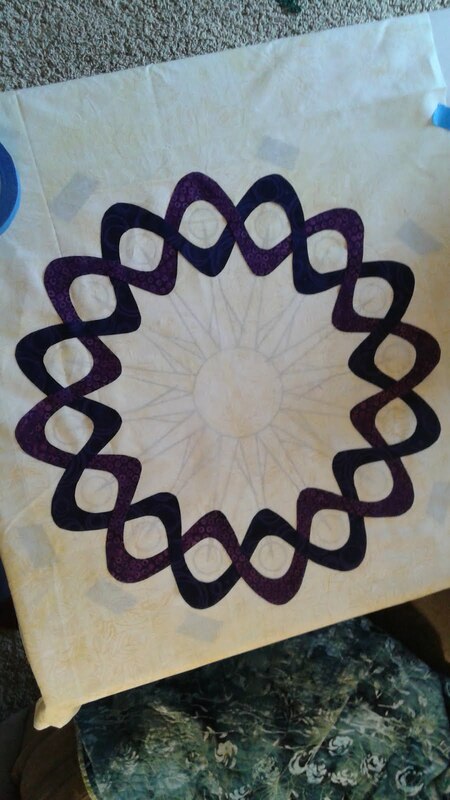 Next, stitch a crescent inside the circle and then a small circle at the end of the crescent. Here are a few stitched out. So it's Quiltweek in Paducah and I have two quilts in the show. I must admit to being a bit disappointed that neither one placed, but upon further reflection I've realized that having two quilts in the show is an accomplishment in itself and I need to get over it. When big disappointment hits me it tends to take 24-48 hours to get over. So I'm getting there. 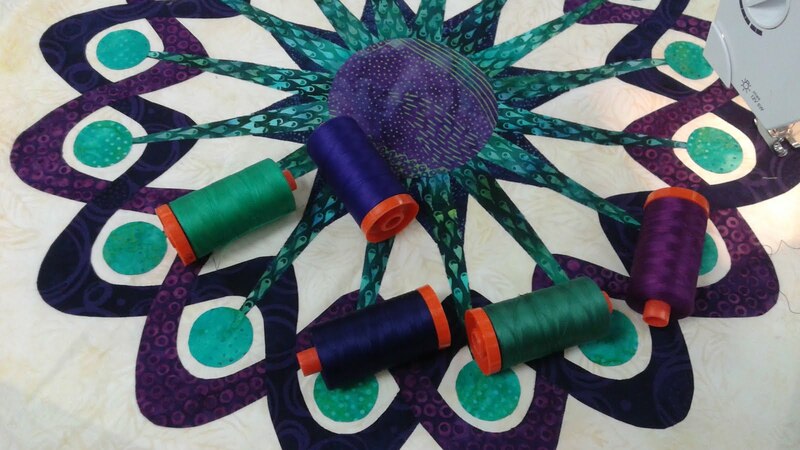 It helps that my newest show quilt will debut next week at the Utah Quilting and Sewing Marketplace (formerly HMQS). So for the next few posts I'll be showing you the process of creating this beauty. 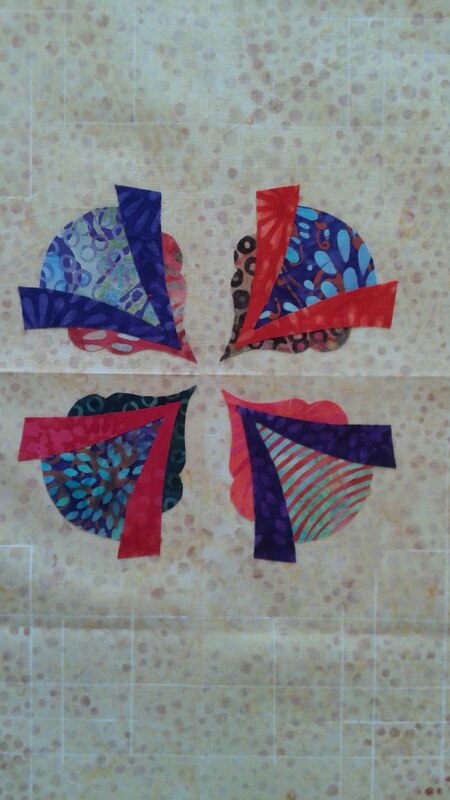 When I design my applique quilts I always do a test layout of fabrics and then use mirrors to see if I like it. Then I can change color decisions before the sewing starts. This quilt was started back in 2014. 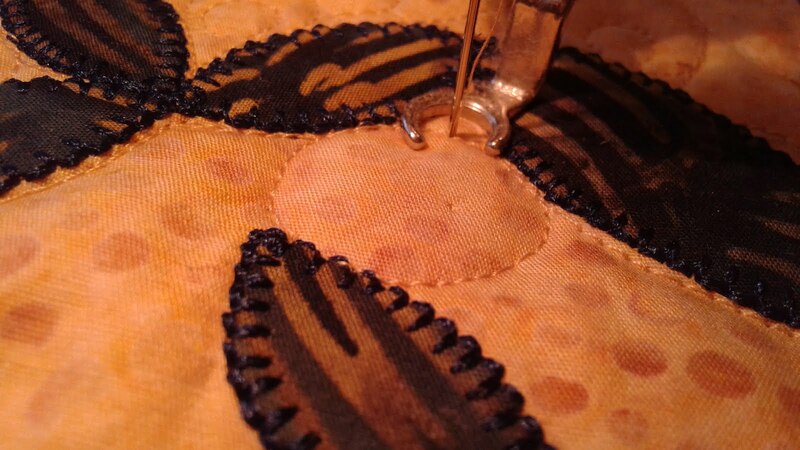 It's hand applique, so it takes a while! I tried to take photos at each stage along the way so here we go. And a closeup for Layer 1. Come back for more later this Saturday. Here are a few random pictures of inspiration from restaurants/museums. Enjoy! 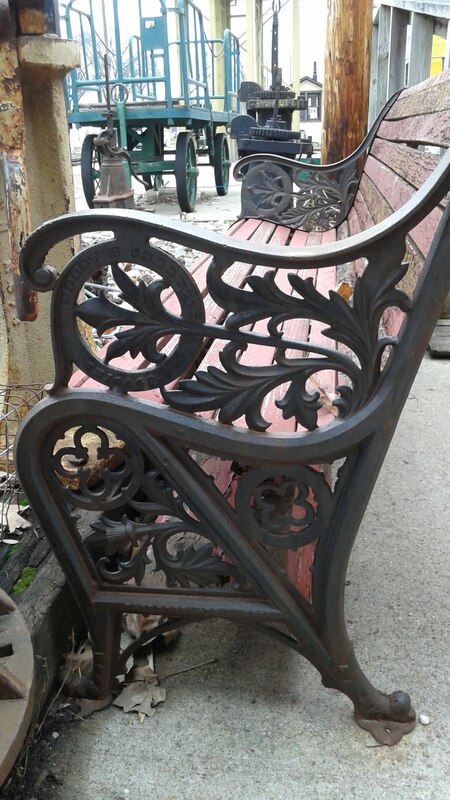 A fun bench outside a train museum. I love the railing on the top of this mock building. 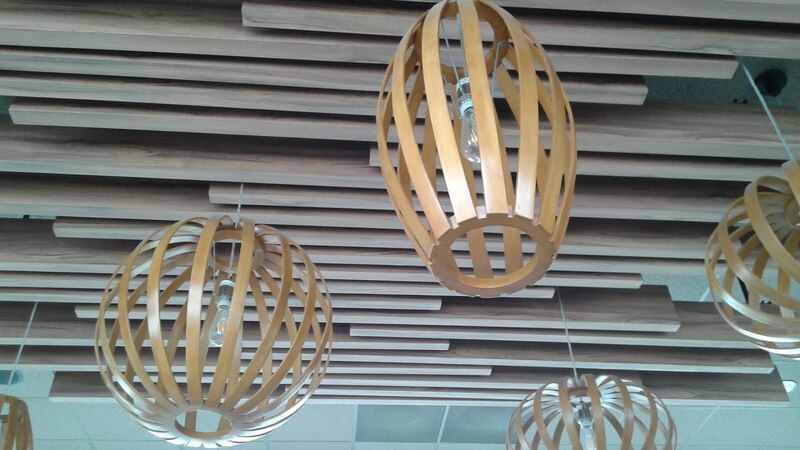 Ceiling decor. I love the juxtaposition of the straight lines and curves. 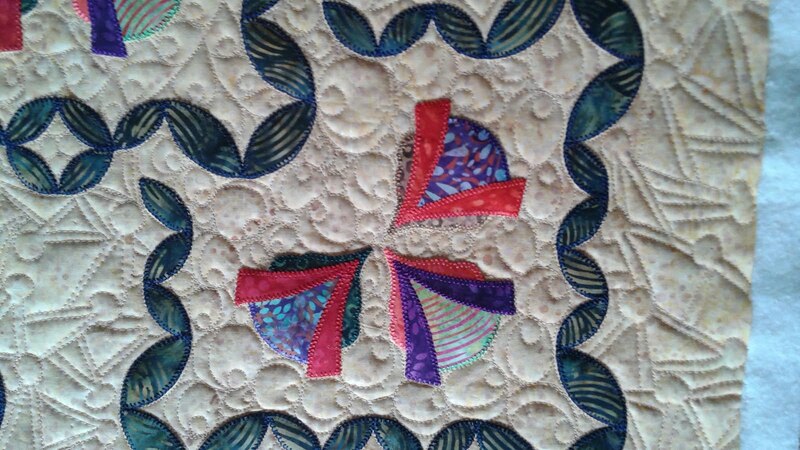 I decided to do some feathered spirals interspersed with a few other filler designs. 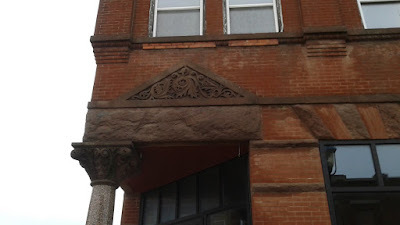 Some of these tight spaces simply needed pebbles because that's all that would fit well. 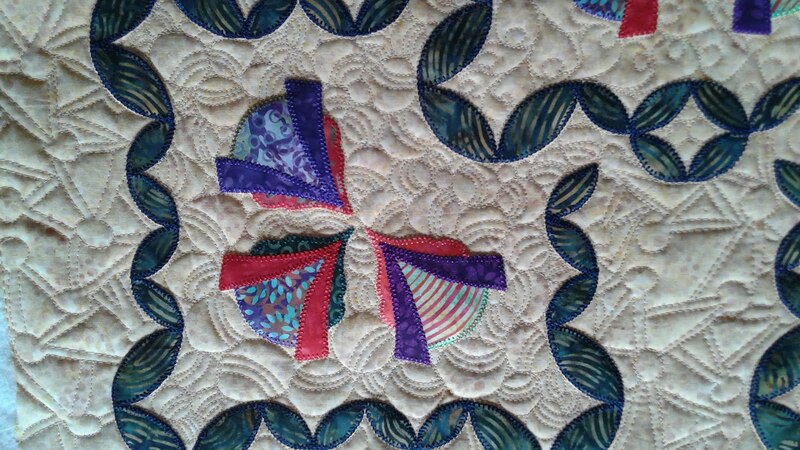 And the whole quilt. Now to figure out what to bind it with. 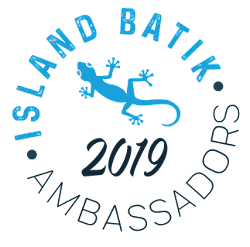 Furry Friday with Island Batiks! Today's Friday post is a special post about our furry friends. 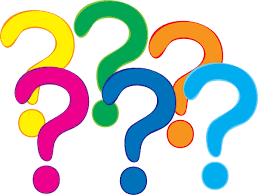 Furry Fridays have two purposes, one to help shelter pets get adopted and the other to provide kennel quilts for animal shelters! This week's Furry Friday is sponsored by the Petfinder Foundation. Surf is the dog of the week! Lola is the cat of the week! And get making those kennel quilts! Materials used should be 100% cotton (biodegradable). Pre-wash fabrics (pets can have allergies just like humans). Finished size should be 12" x 18". This fits the most commonly used small kennel used at shelters. 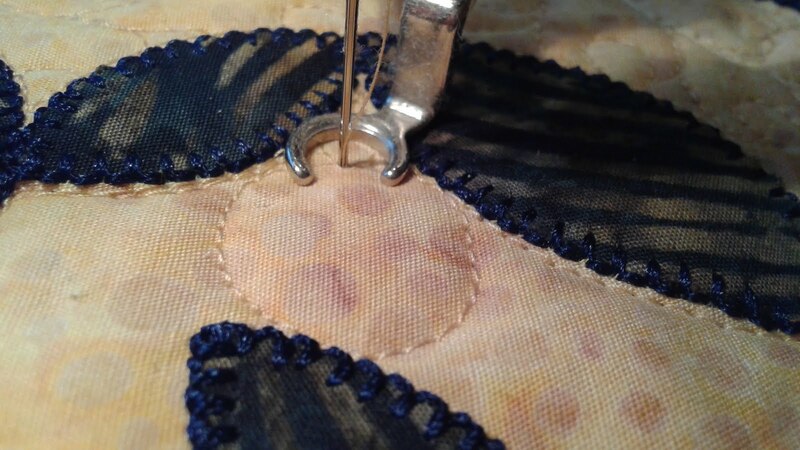 When piecing, use a small stitch length (e.g. 14 stitches/inch). Do not use binding as it can be hazardous to pets if it becomes loose. 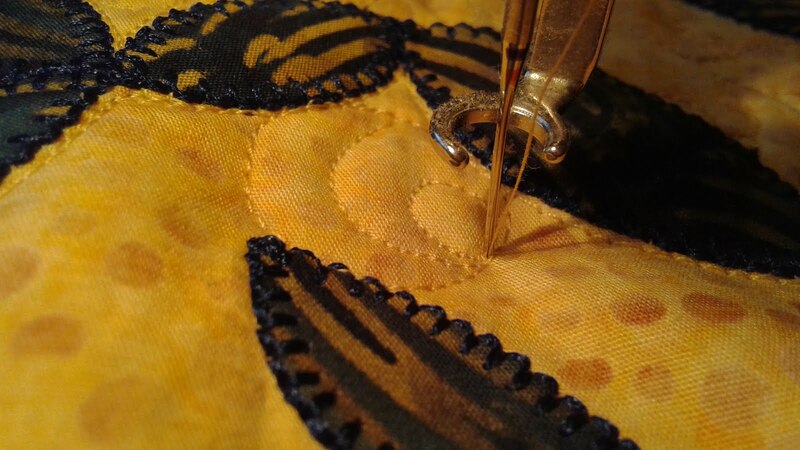 Layer, sew around the edge using a small stitch length, and turn quilts pillow-cover style. 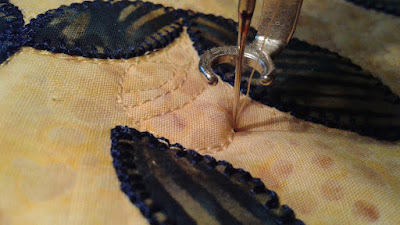 Whipstitch the opening with small, tight stitches. 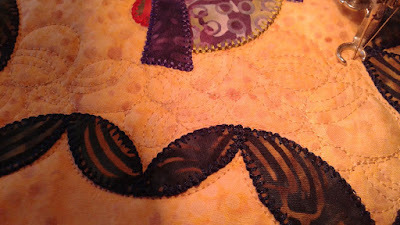 Use only simple appliques that are secured with tight stitches along the edges. Avoid using fusibles. 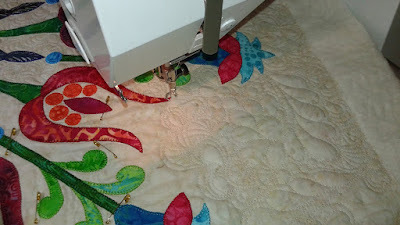 Keep the quilting simple and use small tight quilting stitches that won’t catch on pet claws. 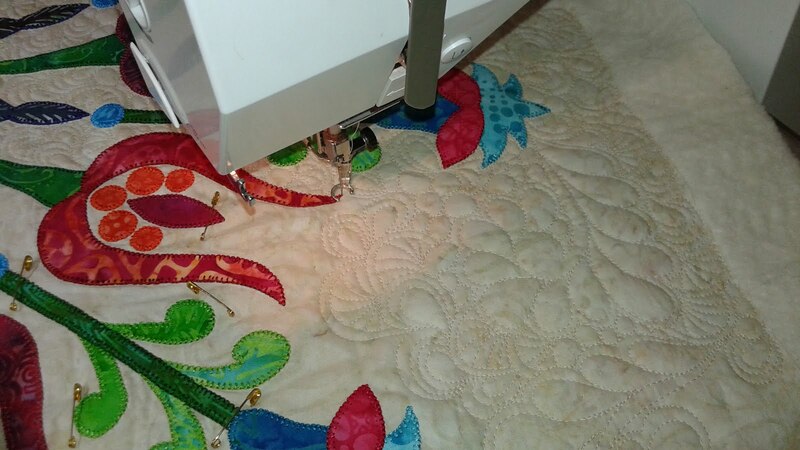 Do not tie quilts as the ends can get caught in claws or chewed off. 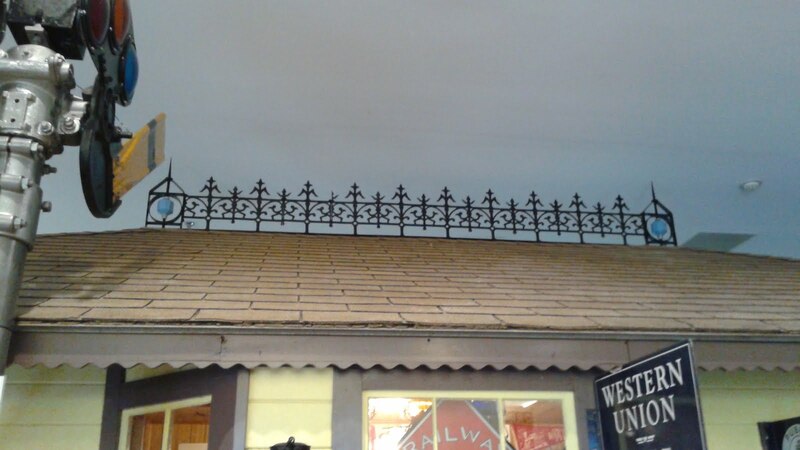 Do not use any metallic threads or other embellishments (e.g. beads, charms, buttons, ribbons, lace, trims, etc.) of any kind. Do not add handles or loops to the quilt. 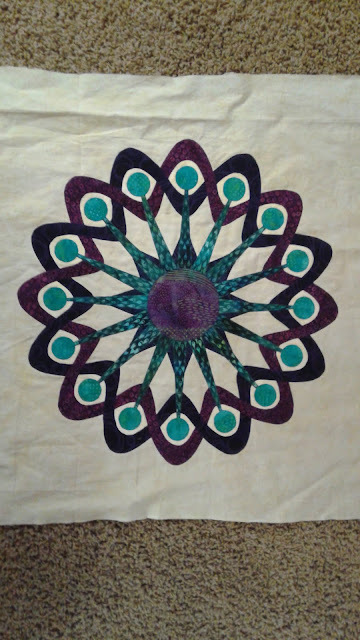 Last week I told you I'd started stitching around my Peacock applique quilt. I finished all the stitching. It's unusual for me to use single instead of double blanket stitch, but I decided to on this project because I didn't want to draw my eye away from the design. Here's the top so far. You really can't see the stitching at all and it lets all the fabrics shine. 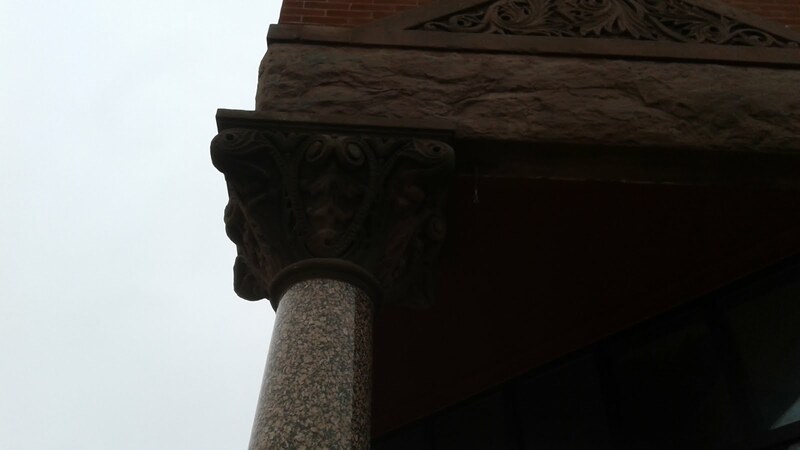 A close-up. Look how tiny those stitches are! 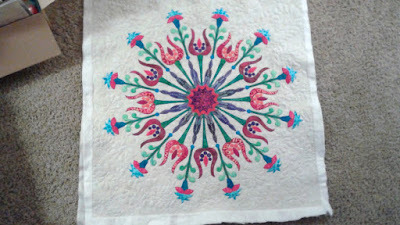 They're done in 50 weight Aurifil cotton. 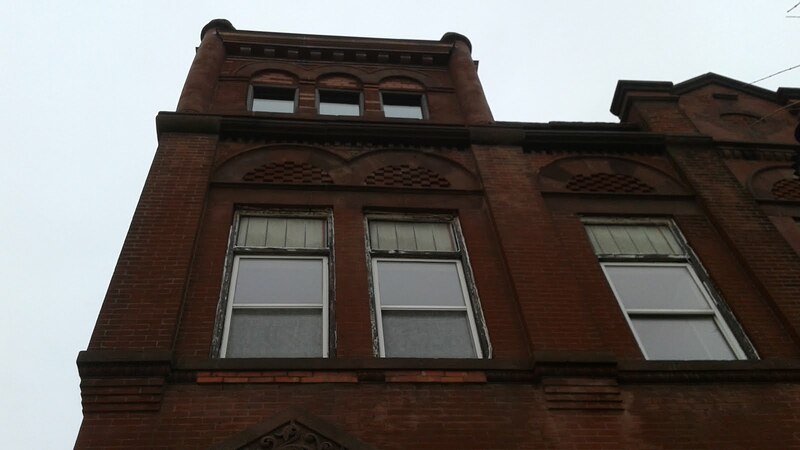 It has no sheen which is what I wanted for this project. 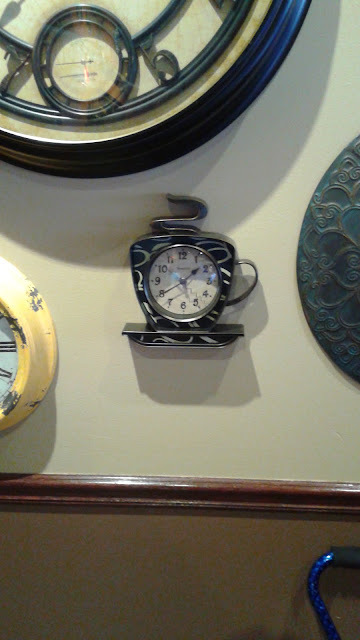 On of my favorite restaurants has a wall of clocks. 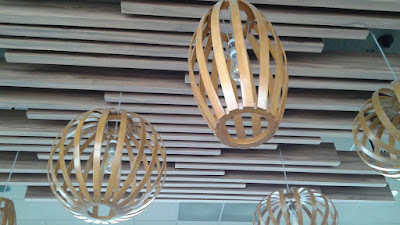 I find them very fun and inspirational. Enjoy! I decided to try appliqueing a circular medallion I designed. I traced out all the pieces and had a blast picking out the fabrics. You can see below that I laid my light fabric on my table and you can see the thick black lines right through without any trouble. Instead of my usual layering I decided to put all the pieces for this quilt on at once since some pieces when over and under others. I also decided to do a tiny single (instead of my usual double) using Aurifil 50 weight thread. It worked wonderfully as always and since it was single blanket stitch I was able to get all the stitching done in an evening! 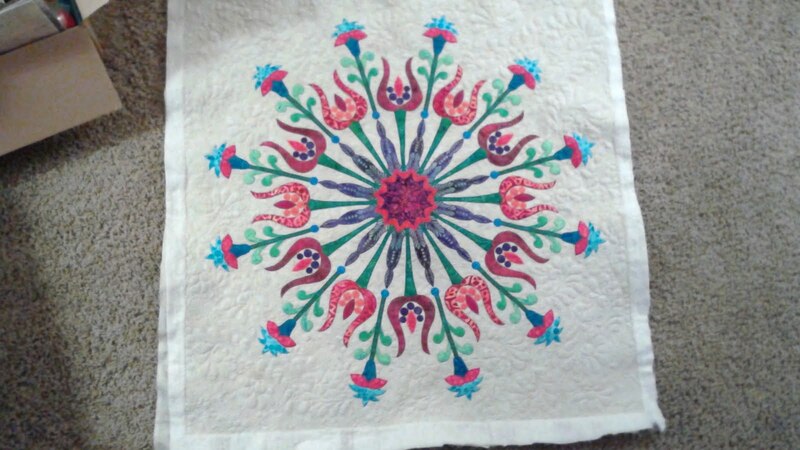 Can you guess from the picture above why my son insisted this quilt is called Peacock? We had quite a chuckle over it. Today's new free motion filler was another I doodled during my son's violin lesson. 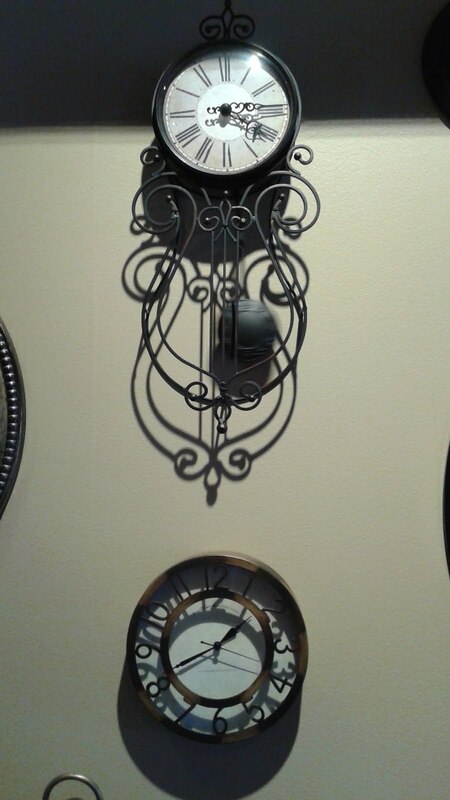 It's a circle that can vary in size with three arcs inside which I'm calling Triple Arc Circles. Start by making a circle 3/4 -2 inches in diameter. Travel along the lines to where you want to start your arcs. 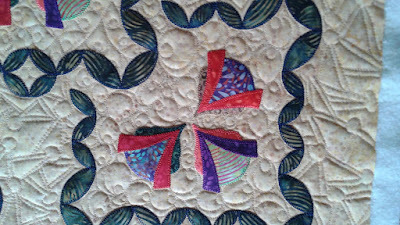 Sew three arcs about 1/8 inch apart as shown below. Then travel along the outside of the circle to where you want to start your next arc. 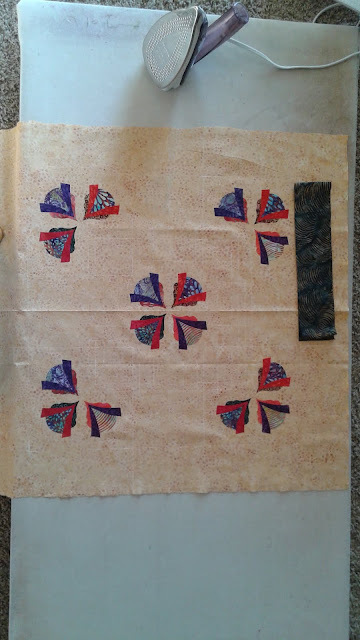 Here are a few arcs all stitched out. And the final pattern in this section of my Adventurous Applique Challenge for Island Batiks! 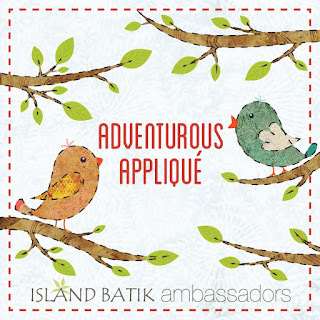 Island Batik Ambassadors Adventurous Applique Challenge! 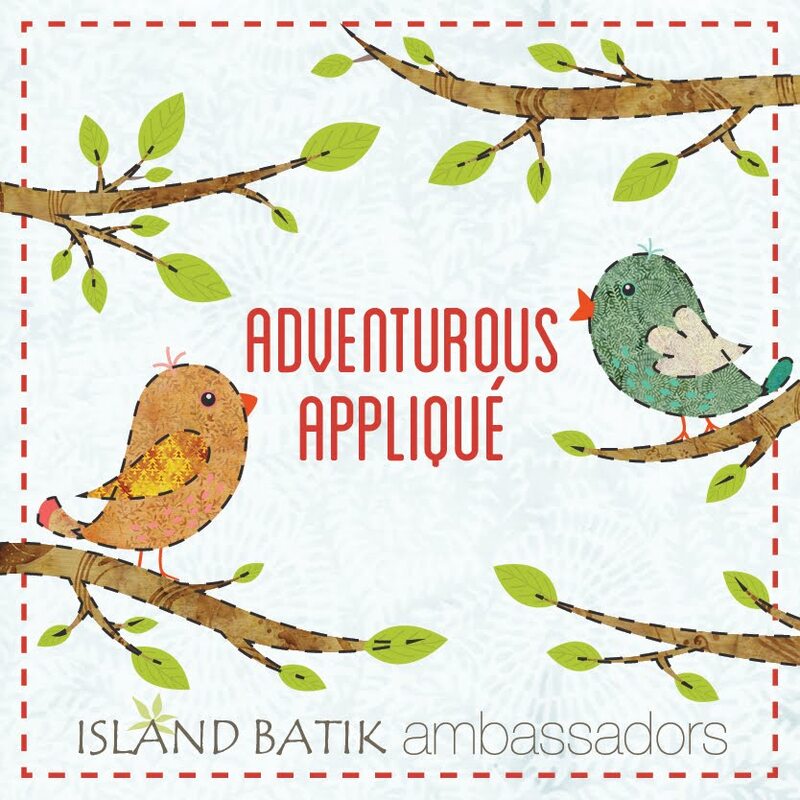 April's Island Batik Ambassadors Challenge is named Adventurous Applique. 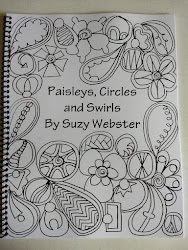 As it's the same title as my blog I was quite excited to get started. 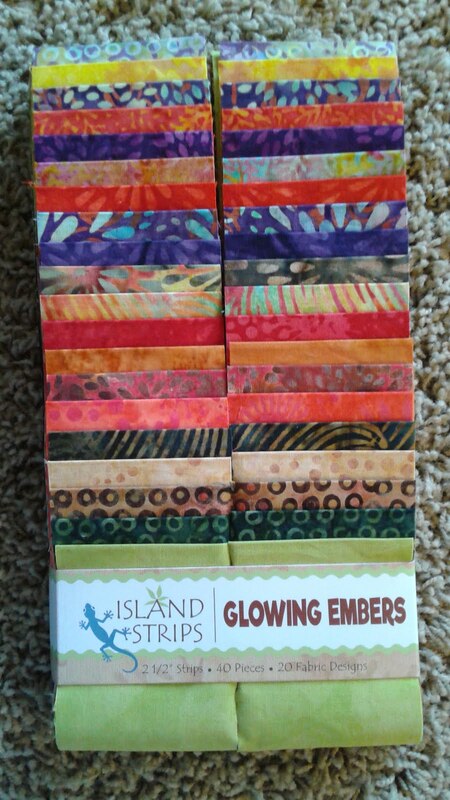 I had this gorgeous set of Glowing Embers to play with, so the only limitation in design was keeping the pieces narrower than 2 1/2 inches. 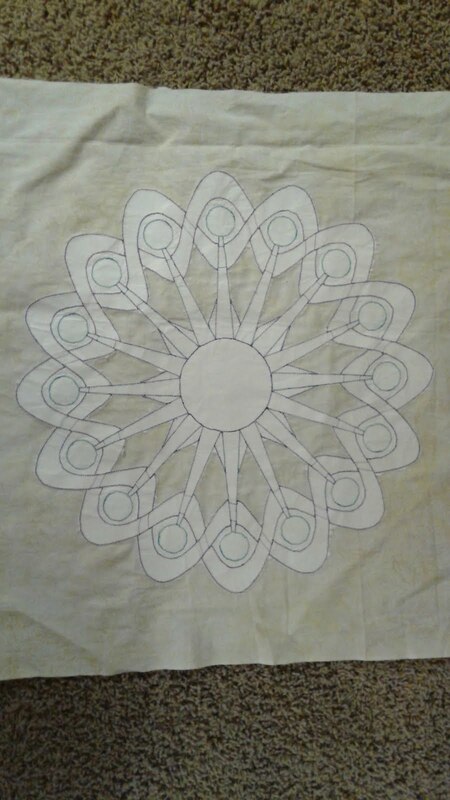 I started with a flower pattern I doodled during one of my son's violin lessons. 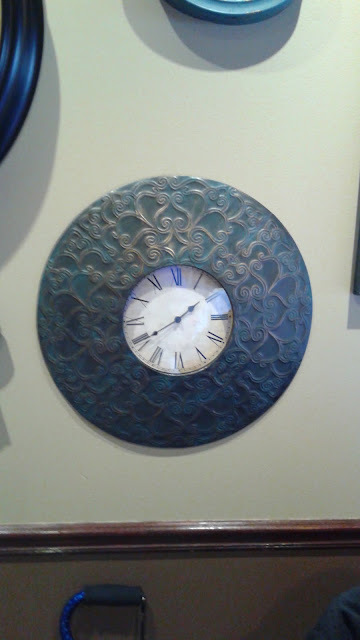 I then decided to put a whole set of four in the middle and sets of three in the corners. If you look carefully all of the flowers in the upper left corners are the same, upper right are the same, etc. So there are four different colorations of the flowers. 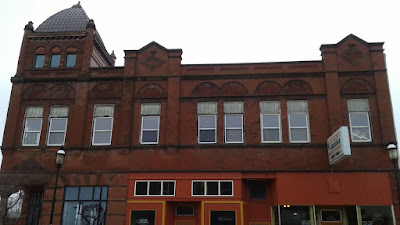 Above you can see the strip of fabric I am going to use for my orange peel style sashing. 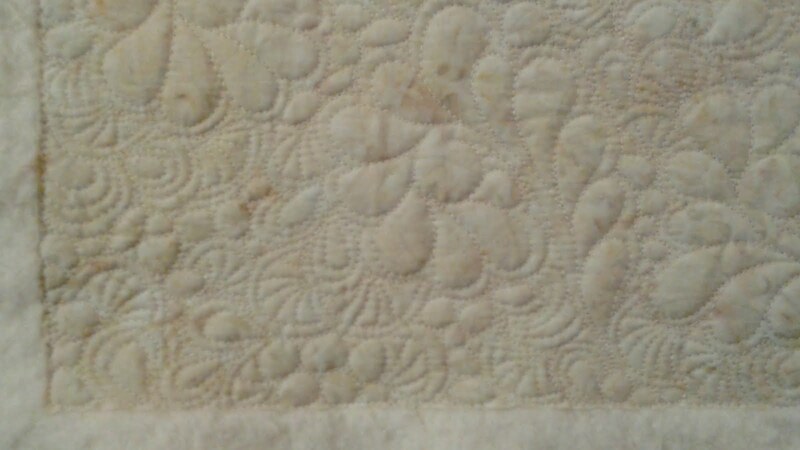 Below you can see lines I've drawn with my white Clover Iron off Pen to help put the orange peels in the correct places. And here it is with all the orange peel pieces added! 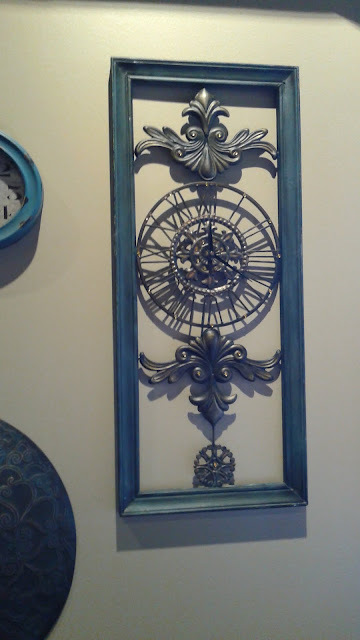 Some are 1 inch pieces and some are 1 1/2 in pieces. And here's the back once all the stitching has been completed and the stabilizer ripped away. 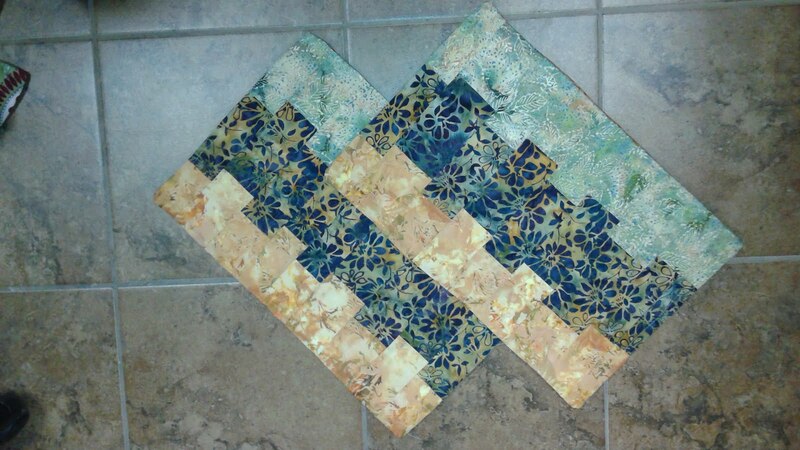 And the final quilt! I decided to add a fat binding since I already had 2 1/2 inch strips. I created 6 unique free motion filler patterns for this quilt which I have been revealing in my Free Motion Friday posts for the last two weeks and for the coming four weeks. 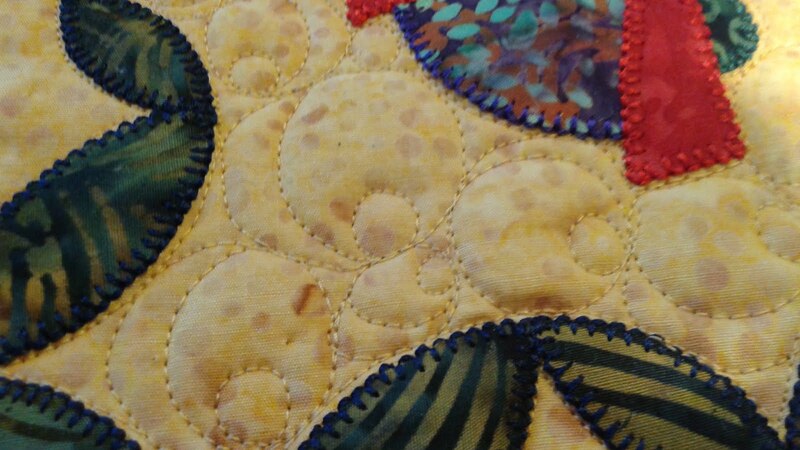 It's quilted with my favorite Aurifil 50 weight cotton thread. Be sure to come back and check them out every Friday or join my Machine Applique Adventures Facebook group so you never miss a post! 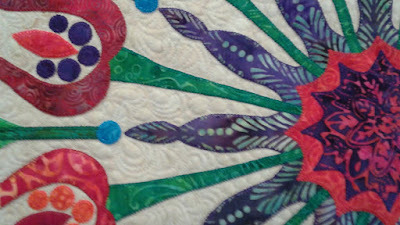 On our way home from Missouri Star Quilt Company we stopped at The Quilted Forest in Forest City, Iowa. 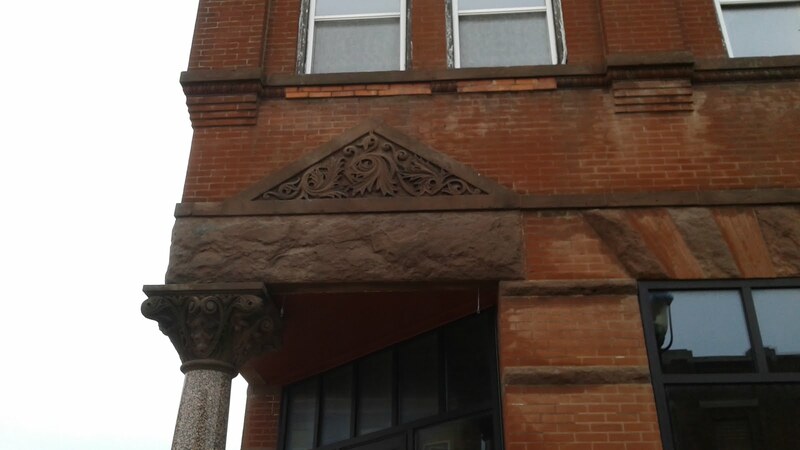 Across the street from it was an old building with some fantastic architectural detail. Enjoy!